Commentary: Radio Drama from J. Michael Straczynski SHELVED! Let’s get it aired! In 2006 the Canadian Broadcasting Corporation’s Radio One division developed and produced a 20 part Radio Drama series called The Adventures Of Apocalypse Al, the show was written by Babylon 5 visionary J. Michael Straczynski. But, CBCR1 has recently decided the show will not air nationally in Canada. We have a big problem with that. And we think you should too. This isn’t a matter of wasted tax payer money. We love CBC Radio, we want CBC Radio to live long, its staff and talent to keep producing their exceptional works. We just don’t think its right that completed and fully produced program not be aired. This is J. Michael Straczynski! His storytelling ability has been proven, the guy knows and loves radio drama. Let’s get this show on the air, podcast, or at the very least released on CD. >Thank you for taking the time to contact the CBC. I think we could all live with a regional CBC Radio One program airing the series. But how do we even make that happen? If you have a blog, and love the work of JMS, write about this problem. 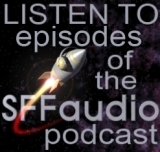 If you loved Babylon 5 and have a podcast, talk about this issue. If you work for one of the many CBC Radio One regional programs inquire about airing the show get the show for broadcast – it is available! We want to hear The Adventures Of Apocalypse Al and we’re determined to see it happen. Folks, let us know what you’re doing and what you’re saying and we’ll post a list of where and from whom this campaign is getting attention. *This one posted with a sub-campaign for Ontario residents: Write-in to the regional CBC Radio programme “Fresh Air“. It airs between 6:00 am 9:00 am Saturday and Sundays. I wish it would podcast, cause I’d like to hear it here in the SE USA. Okay.. I admit this one flew right by me. I had no idea. JMS is my hero! New Arrivals – That Harry "He’s Everywhere" Potter! CBC has Steve The First and Steve The Second airing daily!